There's a reason Warren Buffett's two most important rules in investing are about avoiding losses. Now, take a look at the chart below. The red line has knocked the daylights out of the blue one, outperforming it by a factor of more than 4x. The blue line is the Sensex rebased to 100 at the start of the year 2000. A simple buy and hold strategy in stocks mimicking the Sensex would have earned around 13% CAGR since the turn of the century, a near 7-bagger. Not a bad deal at all. However, tweak it a bit and what you get is a massive 29-bagger, a CAGR of 21% and an outperformance of more than 4x over the buy and hold strategy. 31 Winning Recommendations Out of 35! 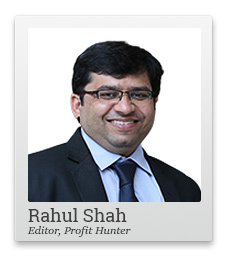 Our top Benjamin-Graham-style research analyst, Rahul Shah, boasts an incredible 88.6 % success rate. Most of which were within a 2-year time period. At only 5% of the normal price! Impressed? Well, the tweak is nothing but Warren Buffett's two rules in action. All I have done is assumed that whenever the index has fallen 15% or more in a calendar year, the investor has been able to move into cash and thus avoid the losses. There were four such occasions in the entire 17-year period with the worst being the year 2008 where the Sensex was cut in half because of the global financial crisis. So, if an investor would have somehow been able to move into cash just when the carnage was about to begin, he would have had more than four times the corpus of a simple buy and hold guy. Is it any wonder Buffett's most important rules have nothing to do with finding the next set of multi-baggers or identifying the next big theme but on the simple strategy of avoiding losses? There's a small glitch though. It is a mistake to assume we can replicate the exact same strategy in real time. For it involves timing the market's fall to perfection every single time it falls more than 15% in a year. This is a skill, no human has perfected yet, and perhaps never will. So, does this mean the upside on offer when we lose less than the market is just a mirage? Should we abandon the effort and try beating the index some other way? By doing what I recommend to my subscribers in Microcap Millionaires, we could try and capture some of the upside, if not all. You see, the market is most vulnerable to a fall when it has risen so much that valuations no longer justify the long-term fundamentals. In other words, a stock market meltdown is often the result of valuations becoming very expensive. Therefore, it could be a good idea to keep reducing exposure to stocks as markets turn expensive and there is too much greed in the system. This is exactly what we have done in Microcap Millionaires so far. Whenever the markets have turned expensive, we have trimmed our exposure to stocks to no more than 25% of the total corpus and have recommended subscribers to invest the remaining 75% in fixed deposits. It's worth pointing out that the service has been able to avoid the current meltdown in Mid and Small Caps on account of having this very rule in place. Thus, even as the BSE Small Cap index has corrected around 25% since the start of the year, Microcap Millionaires is down only 5%, achieving the Buffett objective in style. And this is not the first time it has lost less than the index in a correction. Smartly moving money between equities and fixed deposits based on market valuations has played a key role in the service outperforming the Sensex by more than 100% and returning 173% since inception. My readers think this is purely because of the multiple winners we have recommended over the years. Yes, that's certainly part of the reason. However, it would be wrong not to acknowledge the role this principle of avoiding big losses has played. It actually makes one want to look forward to a bear market as much as a bull market. PS: There is a Special category of small caps which could not only create a lot of wealth over long term...but could even become the Blue Chips of tomorrow. We call such small caps - Junior Blue Chips. Learn about them here.